The Joint Contracts Tribunal are publishing a completely new standard form of contract for large clients on major construction projects. The main purpose of the form is to meet the particular needs of large commercial clients who do not themselves intend to occupy the premises, as well as property owners and developers (such as hoteliers and supermarkets) who regularly build. 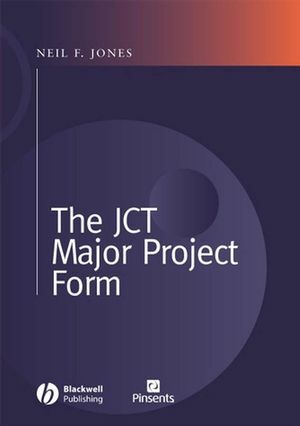 The Major Project Form is the first JCT form specifically to provide for third party rights. It caters for various levels of design input on the part of client and contractor and incorporates a design submission procedure. Other key provisions are those dealing with: no retention, acceleration of project, bonus for early completion, cost savings and value improvements, the client's pre-appointed consultants, and mediation. will examine the background law, highlighting practical issues. Neil Jones LLB (Hons), FCIArb is a practising solicitor with the national law firm, Pinsents. He is a well known figure in the industry and was founding member of the highly successful niche construction firm, Neil F. Jones. He is a Council member of the Joint Contracts Tribunal and is Chairman of its Drafting Sub-Committee. He is also the retained Legal Advisor to the Local Government Association’s Procurement Panel. His book on the JCT Intermediate Form of Contract is also published by Blackwell Publishing. 7. Assessment and Third Party Rights. 8. Default and Dispute Resolution. 9. Communications Definitions and Attestation. 10. The Appendix to the Major Project Form. MPF Clause Number Index to Text. MPF and WCD 98 Clause Comparisons.